from INS Reporter, Vol. 26, No. 3 (Winter 1977-1978) pp. 41-46. "The high waves of military naturalizations followed World Wars I and II and the Korean and Vietnam conflicts, and were largely the result of legislation enacted during these periods. The first records of military naturalization began during World War I, when the Act of May 9, 1918 (40 Stat. 512) was enacted providing for the naturalization of alien soldiers at the various training and assembling points in the United States. During the years 1911 to 1920, a total of 244,300 soldierfs were naturalized, this number almost equaling the total military naturalizations during the next 35 years. A number of laws enacted subsequent to the 1918 Act waived certain naturalization requirements for aliens in the U.S. Armed Forces. Between World Wars I and II there were nearly 80,000 military naturalizations. With the outbreak of World War II, the Second War Powers Act of March 27, 1942 (56 Stat. 182) (Sections 701 and 702, Nationality Act of 1940), was passed providing for the expeditious naturalization of members of the U.S. Armed Forces serving in the United States and abroad. Between March 27, 1942 and June 30, 1947, a total of 121,342 persons in the Armed Forces were naturalized in the United States under this law and 21,011 persons were naturalized overseas by designated representatives of this Service. Special legislation for the expeditious naturalization of certain members or veterans in the Armed Forces was again passed in 1953, with enactment of Public Law 86. (67 Stat. 108) During the Fiscal Years 1954 and 1955, a total of 23,998 persons were naturalized under the provisions of this law, 18,478 in the U.S. and 5,520 abroad." under the Act of May 9, 1918. As noted above, "The first records of military naturalization began during World War I, when the Act of May 9, 1918 (note 5) was enacted providing for the naturalization of alien soldiers at the various training and assembling points in the United States." This naturalization form doesn't seem to be much different from a non-military one. Here, the petitioner's army buddies acted at witnesses to his naturalization, done through the U.S. District Court, District of New Jersey. "I served outside the continental States in the U.S. Army in World War II." A U.S. citizen attests to the petitioner's good moral character, etc., and he is now serving in the military of naval forces of the United States, names his rank and states the company he is attached to and at what military base. "Under act June 30, 1953; P.L. 86, 83rd Congress by members of Armed Forces outside of the United States." the time of entering such service. Also, it seems that one could legally change their name on this form too, and could decide which naturalization court would have jurisdiction over their naturalization proceedings. 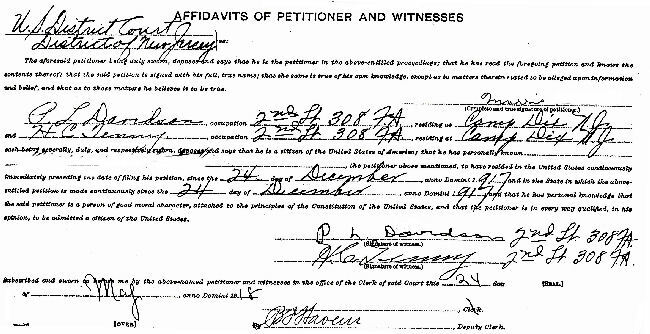 "Upon consideration of the foregoing petition for naturalization, the affidavits, testimony, and evidence in support thereof, and the petitioner having taken the required oath of allegiance before me, it is hereby ordered that the petitioner be, and hereby is, admitted to become a citizen of the United States of America, this __ day of __ 195_, at (town/country-here Munich, Germany), and that the petitioner's name be changed to __." So, even here, one could change their name at the time of their naturalization.